Help! I’m locked out of the system. How do I get back in? In order to unlock your access to the new eBanking platform, you must call the credit union at 352-381-5200. On the initial Secure Login page where you enter your User ID and on the following page where it asks for your password, there is a Forgot Password link. To reset your password in this manner, you will need your User ID, your account (or member) number, last name (or business name), DOB (or business start date), email address and primary phone number. You may also contact the credit union at 352-381-5200 for a password reset. I forgot my user ID. How can I retrieve it? On Secure Login page, there is a “Forgot your User ID” link. To retrieve your User ID, you will need your account (or member) number, last name (or business name), DOB (or business start date), email address and primary phone number. You may also contact the credit union at 352-381-5200 for assistance. How do I change my user ID or password? Can I set up a quick login for my other SunState accounts? Yes – This feature requires the member being linked to provide you with their User ID and Password for the target account. Once you have this information, from the menu, select Profile, then User Profile, then Quick Login. Click the Add Account button, then enter an Alias for the account, the Login name (User ID) and password for that account. After you have completed these steps, you will be able to login to this account by following the same path (Profile, User Profile, Quick Login) from the link on the right of the listing. How do the security features work on the new system? The first helps you verify who we are: Your Personal Image is a security feature that lets you verify that you are logging in to our legitimate site, and not an imitation site designed by a criminal. From now on, whenever you log in, your Personal image and the name you gave it will be displayed. Once you verify that your image and name are correct, you may enter your password and access your account. If you do not see your Personal Image, do not enter your password. First, verify your User ID. If your Personal Image still does not match, contact us immediately. After entering your password, if anything out of the ordinary is detected, we will ask you a few additional security questions to verify your identity. These are questions that you will establish, so answering them should only take a moment. However, someone trying to gain unauthorized access to your account would be stopped, even if they had your ID and password. Additional security features are in place to detect unusual activity and prompt you to validate it. However, you won’t see these until the system learns your typical behaviors. Even then, you may never encounter them. What should I do if I do not recognize the security image or security phrase on my screen? Under no circumstances should you provide your password if this occurs. You should immediately return to the original login screen and verify that you’ve input your User ID correctly before proceeding. If the image and phrase are still incorrect, please call and notify the credit union at 352-381-5200 for further assistance. I’m new to eBanking. Why am I seeing a random security image? First time eBanking users will see a random security image during the enrollment process. To select your personal image, please continue with the enrollment process. I’m setting up my security questions. Why won’t the system accept my security question answers? I’m a new member with SunState. What information do I need to enroll or register to use eBanking for the first time? When registering for the first time, you will need your account number (also referred to sometimes as your Member number). For personal accounts, you will need to enter your last name, Date of Birth, email address and primary phone number. For Non-personal accounts, you’ll need to the account number, the full name and creation date of the business or Trust, an email address and business phone number. There is a new Make a Transfer tile on the front page. Choose “Transfer Between Accounts” and follow the prompts to transfer between your SunState shares. You also have the option of using the Transfer tab and “Make a Transfer”. How do I transfer money to other SunState accounts? Click here for a helpful step-by-step guide! 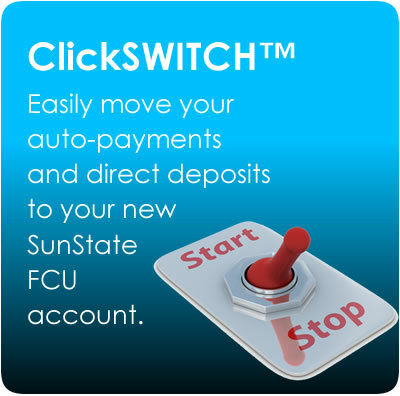 For your convenience, there are 2 ways to transfer funds from one SunState account to another. For one-time or infrequent transfers, choose Transfers from the menu and select Unlinked Accounts. Designate the account type (Checking, Savings or Loan). Next, enter and confirm the account number (this feature require that you know the base account number and share or loan ID (formatted as follows: Share: xxxxxx-S00xx, Loan xxxxxx-L00xx). For recurring transfers, select the Transfers tab, choose the share you are transferring from and which share you are transferring to, enter the amount, the scheduling option allows for immediate (one-time transfers), future dated (one-time), an recurring transfers. You may also contact the credit union at 352-381-5200 and have us help you customize your transfer records so the target account appears in a pulldown menu under the Manage Transfers feature. How do I transfer funds directly to another person using Bill Pay? Once you are in the Bill Pay utility, choose Add Payee. Click Pay a person and follow the prompts to complete the transaction. How do I send a wire transfer request? You now have the option of setting up Payees, we recommend this option for our members who send frequent wires to the same individual/company. This store your wire instructions for any future wire transfers. One-Time transfer, if you are only making a single payment to a person or company, we recommend you use this option. Please keep in mind, the information entered in the One-Time option will not be saved for future transfers. We also have another feature which allow you to view your Wire History. Can I transfer money to or from another financial institution where I have an account? Yes – From the Transfers link on the menu, choose External Accounts. Under Manage External accounts, click the Add External Accounts button and fill in the requested information (all fields are required). Please keep in mind that a test deposit will be sent to the external account (other institution). Once you have retrieve the amount from the other institution, you will need to verify that amount within the Sunstate site. Please allow 3 business days for the transfer to reach the other institution. Once you have successfully logged on to eBanking, the homepage will have an Account Summary tile, select the share you would like to view and you can view the recent transaction. You may also find this information under the Accounts tab and Account Summary or Account Activity. How do I view my credit card information or request a cash advance or make a payment? Under the “Accounts” tab on the menu, you’ll find links to Go To My Card which will take you directly to the Visa site to view transaction, make a payment, or request a cash advance. Under the “Transfers” tab, there is an option to transfer the credit card payment from your Sunstate account. Under the Accounts tab, you will find the Visa Cash Advance option, this will allow you request the cash advance. Under the “Profile tab, you will find an option for Secure Forms, this will also allow you to request the cash advance. What is my available balance vs my current balance? Current Balance is the balance in the account if there are no transactions pending to clear. Available Balance is the balance in the account with all of the pending transaction taken out of the balance. If all of the transaction that are pending were to clear today, this is what you would have available to spend. Pending transactions are those that have been pre-authorized by a merchant, but have not yet cleared the account. Where do I find my pending transactions? Why is my pending transaction different than the actual amount? One example of why your transaction amounts could differ is; at the gas pump, an initial authorization is requested prior to dispensing fuel and determining the final amount of the purchase. When you pre-pay for gasoline at the pump, the gas station doesn’t know how much gas you’re going to buy. Stations want to make sure you can afford to fill up—so they authorize holds of $50, $75, even $100, which will fall off after the gas company processes that transaction (this usually takes 2 to 3 days). Another example could be for a rental car company that will preauthorize a certain dollar amount then send the actual amount charged through to your card at a later date. Statements may be viewed by choosing Accounts on the menu, then eStatements. Pop-up blockers must be disabled to proceed to the page to view your statements. How do I cancel my eStatements? How do I transfer my transaction history to a spreadsheet? Under Accounts on the menu, select Account Activity. Customize the desired data using the fields, and select the Search button. Below the Search button is a prompt to download for Spreadsheet. How do I view my Secure Messages? At the very top of the site in the black header bar, click the envelope icon to view any secure messages. Using the Profile Tab, select Messages. This will take you to your inbox where you are able to view as well as send secured messages to the credit union. The last selection on the menu is Profile. Under Profile, the fifth selection is Alerts. In the 2nd panel, you can set up or edit any alerts for your account. Choose Profile from the menu, the User Profile. At the bottom of the list is Text Banking. Choose Click the Add Phone button to add up to 5 devices/ account. Our Online Bill Pay utility remains the same. To access it or activate it, choose Pay Bills from the menu. How do I request a stop payment on a check/draft? Under Accounts, choose Stop Payments. Choose the checking account, select Single or Range of checks, check number (or numbers if applicable), the amount, and the share from which to withdraw the $35 fee. What kind of loans can I apply for online? You can apply for Auto/RV/Boats/Motorcycles, Credit Card, Line of Credit, Personal (Signature) Loans. Unfortunately, you are not able to apply for Real Estate or Business Loans at this time. Are transactions from eBanking/Mobile Banking processed at a particular time? Most transactions and transfers are all processed in real-time. Some transactions such as Wire Transfers, Visa Cash Advances and Mobile Deposits may be processed later in the day or require further review as necessary. For more information or questions, please call our contact Center at 352-381-5200. Can I open or close shares from my own account in eBanking? One feature we’ve added with the new eBanking platform is the ability to open Special Shares and Money Market accounts. From the Profile link on the menu, select Add Share and follow the instructions to add your new share. To close accounts or shares, you will need to visit or branch or call the Contact Center at 352-381-5200 for instructions and details. Do I need to update the SunState mobile app on May 16, 2017? Yes! SunState’s new eBanking platform has a new mobile app. You will need to delete the old SunState app from your mobile device(s) and download/install a new one from the App stores. Do I need to enroll in the eBanking mobile app separately? No, our new platform supports registering through the Mobile app or online. 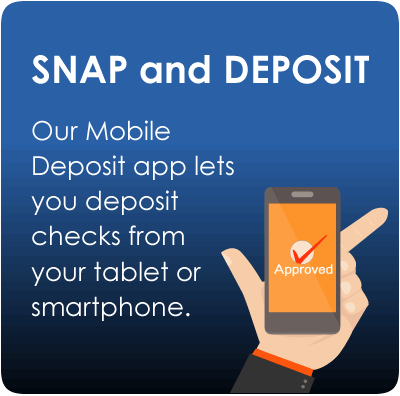 Is mobile deposit (deposit a check using my mobile device) available in the new eBanking mobile app? Yes, for qualified consumer accounts. Fast Balance is a new feature that will allow you to view account balances without actually logging in to your Mobile Banking app. You may customize which shares are visible by selecting Profile, User Profile, Manage Fast Balances. Check the boxes next to the shares you would like to see and click Submit. Can I enable my fingerprint authentication on the mobile app? Yes, fingerprint authentication is only available for Apple devices at this time. Androids will be enabled for this feature in a future release. Does the mobile app have different features and services than the desktop/computer platform? In addition to being able to perform all of the functions available in the desktop version, the mobile app offers mobile deposit for qualified accounts and a new feature called Fast Balances. Will I need to log onto eBanking from a computer before using the mobile app after the update? No, members will be now able to register their accounts via Mobile Banking instead of having to login through eBanking first to access the smartphone app. What Mobile Browers are supported? In short, this service will be interrupted and unavailable until 5/23/17. How do I download my transactions into Quickbooks or Quicken? Under Accounts on the menu, select Download Data. You will be prompted to choose a share, a starting and ending date. There are links on the screen to download the Quicken and QuickBooks formats.